The top (or Hood for us Brits) is one example where the Longbridge cars differ significantly from the later Abingdon roadsters. (Note. cars made at Abingdon until March 1958 also had the `Longbridge` features). Then collapse the hood sticks together. Restorers should note that the everflex top is attached to the frame by two tapes which are sewn to the top itself. 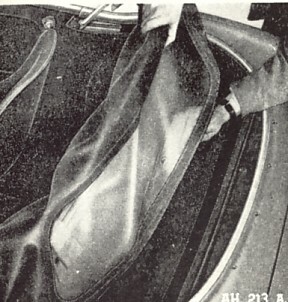 The tapes are fastened to the back two bows but not to the front one. Then fold the hood side flaps into the centre of the well leaving the hood sticks clear of any material at each side. On the left is the later 3000 bow which is thicker 20mm guage. 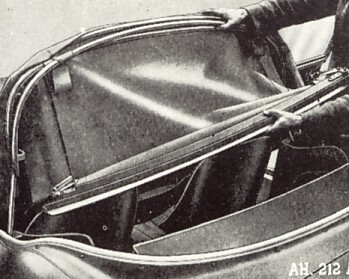 The frame slots into the tonneau cover bar holes. On the right is the late BN4 early 3000 frame made of 16 mm guage. 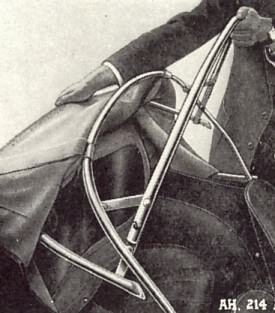 The leg has a bend in it and smaller pegs on the end which fit into their own holes not the holes for the tonneau bar. This is the key trick. 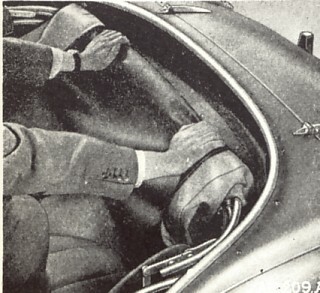 Then fold the rear end of the hood under the rear window. 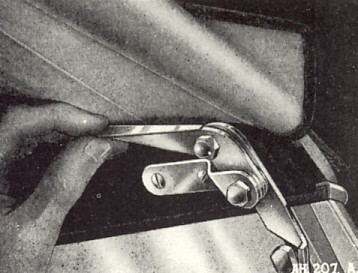 This is also where it is a bit tricky as you should avoid unecessary bending of the rear window pane. Erecting the top is relatively straight forward although do not think that because it is permantly attached to the body it is similar to a BJ7 or BJ8. In fact its probably more fiddly to erect than an Abingdon car. 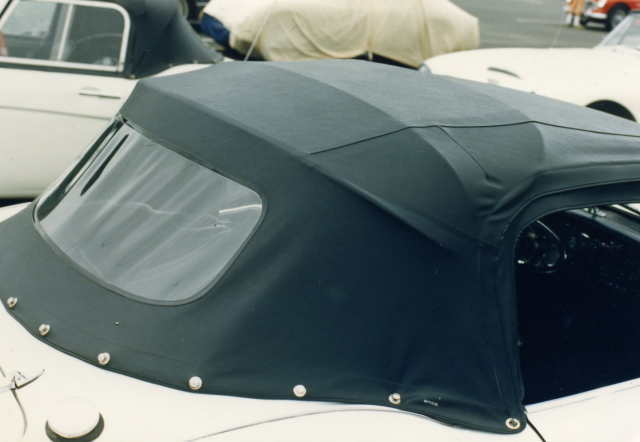 If you think its going to rain and don`t like getting wet then put the top up before you leave home! 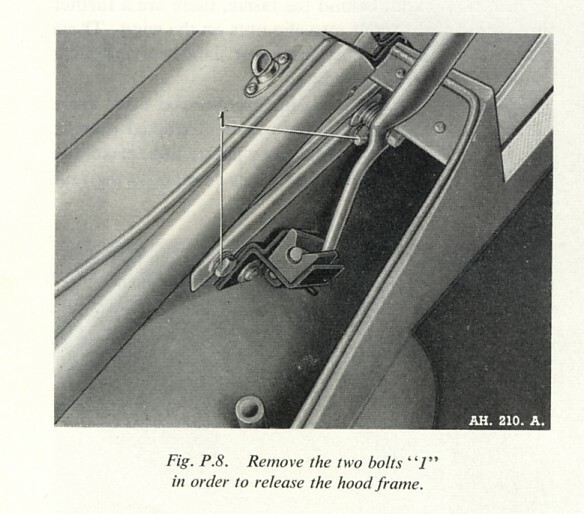 - first attach the top to the windscreen with the two clamps making sure it is properly hooked under the lip. - Then fasten several or all of the rear Tenex press studs to the rear shroud. If the top is a tight fit, as it should be, the studs are easier to fasten before the frame is erected. - Erect the frame ensuring that the spreaders are fully extended. This is a bit like opening an umbrella but can be quite tricky if they are stiff. It definitely helps to have two people, one on each side to ensure the spreaders open properly. - The frame should be fully forward in the slides and then tilts backwards slightly. 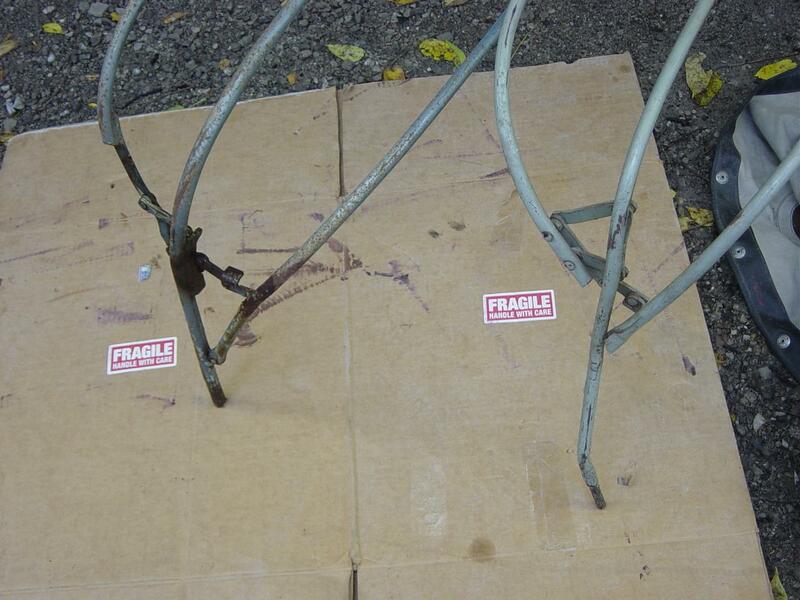 The hooks are pushed into the securing rubber blocks. 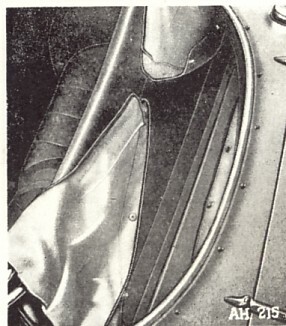 Then push back the hood assembly so that its sits right back in the well. 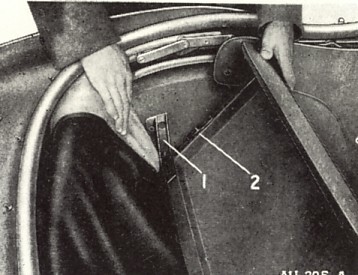 This should be a simple matter of reversing the above process, however there are a few worthwhile rules to follow if you want the hood to fit properly behind the rear seats. I may be biased on this but I believe that the Longbridge top gives a nicer outline. I`d also say that. although with the top down the BN6 is a better looking car than the BN4 - with the top up the BN4 has the better proportioned profile. 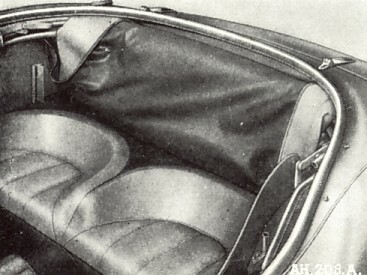 The Longbridge top frame is permanatly attached to the body of the car. At its base it sits in sliders which allow it to be pushed back when stowing behind the seats. 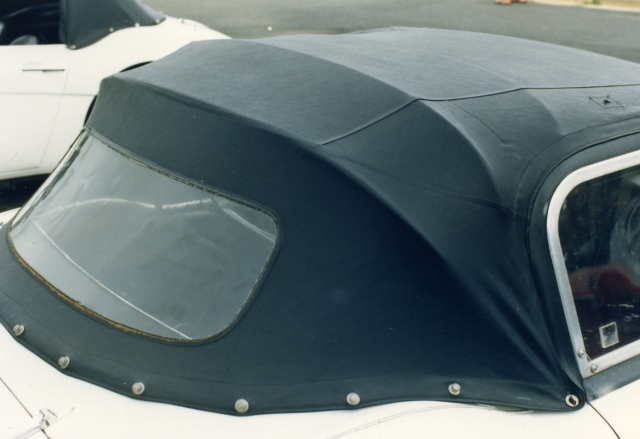 A perfectly folded hood pushed back into its storage position. I guarantee yours will not look like this! !